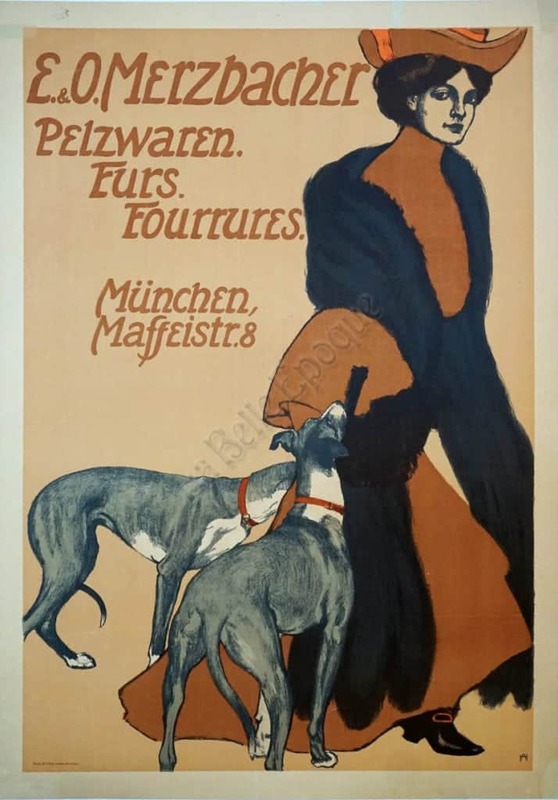 This is a very rare German Art Nouveau period advertising poster for E.O. Merzbacher department store by Adolf Hofer. This exceptional original vintage poster features a simple color scheme of grays, blacks, and rusted oranges. On the right hand side of the image is an elegantly dressed woman, wearing a hat that matches her dress, and a fur wrap. Behind and beside her are two gray and white dogs. The left hand side of the poster features text with information pertaining to the department store. This is a wonderful example of the influence of the simple lines of the Japanese woodblocks on vintage art nouveau posters in Germany. Hofer was a German artist who is primarily known for his painting, in addition to the advertising posters he created.